The suburban landscape is a tough place for a tree to grow. It must overcome competition from grass and other landscape plants, limited growing room, and often restricted sunlight and water. But typically the greatest challenge it must overcome is poor soil conditions. Where did these poor soil conditions originate? At some point in history this area was a natural habitat with a healthy, thriving soil food web. Organic matter, such as leaves and decaying limbs, was plentiful. It fed fungi and microbes, which fed protozoa, springtails, nematodes, and mites. These in turn fed earthworms, ground beetles, millipedes, centipedes, ants, and spiders, which in turn fed a variety of other higher-level consumers such as birds. Thus the soil food web cycled ever onward, producing soil with sufficient nutrients and proper aeration. Trees growing in these soil conditions were happy trees. But then development began. To make way for new construction, bulldozers scraped away top layers of soil – essentially the functioning soil food web – and, in the process, compacted the remaining soil. Needless to say, trees growing in these post-development conditions tend to be sad trees struggling to survive. Those that do survive are often unhealthy, stunted, and plagued by all sorts of insect and disease issues. So what can you do to help your trees? First and foremost, your trees need nutrients. 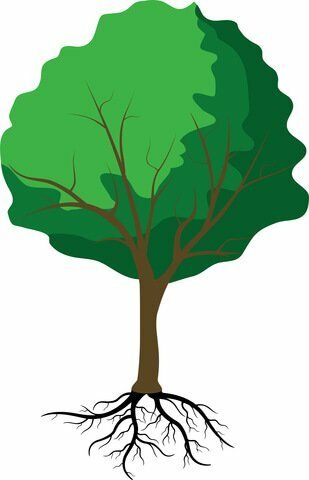 Fertilize your trees bi-annually, but do not use products with high nitrogen content (3 to 10% is plenty, you do not want to over stimulate growth). Do not overuse phosphorus, otherwise your risk polluting the water table. Use products that are all natural with a low salt index. Most importantly, the fertilizer should contain organic matter and microbes. These components are essential to helping rebuild the soil food web. Tree roots and the various creatures that make up the soil food web need air to survive. Depending on how compacted your soil is it may be necessary to aerate the soil. Most soil in the suburban landscape needs aeration. This can be done in a number of ways, but the most effective, least harmful method is to use an air spade. This tool utilizes high-speed air to break up the soil without damaging the roots. 1. Use fertilizers that have organic matter in the ingredients. 2. When aerating, blend organic matter into the soil. 3. Place wood chips around your trees to a depth of 2-4 inches. Do not place the mulch around the trunk. Extend it out as far as you are able to tolerate (the edge of the canopy is ideal). 4. Do not rake away leaves from under your trees after they fall in autumn. Mulch them and leave them in place. Ultimately your most important goal is to re-build the soil food web and recreate what naturally happens in the forest. Healthy soil is teeming with life and has plenty of nutrients and aeration, making it a critical first step to fostering happy, healthy trees. Basil Camu is co-owner of Leaf & Limb Tree Service, a tree care company based in Raleigh.